John Walker (Left Back, 1906-07) - John Walker was born in Beith in1882. In the junior ranks he wore the colours of Eastern Burnside, Cambuslang Rangers and Burnbank Athletic. Senior football then beckoned and John joined up Raith Rovers. Spells with Beith and Rangers followed before he joined Cowden in 1906. John played just one season for Cowdenbeath but made a marked impression with his incisive tackling and quick thinking. Other clubs sat up and took notice and John was enticed to sign for Swindon in the summer of 1907. Over the next 6 years, Walker developed into one of the finest full-backs in the British Isles. He was capped 4 times by the Southern League and won a Southern League championship medal. Swindon also reached the FA Cup semi final. John's play brought him to the notice of the Scotland selectors and he earned 9 caps as Scotland's regular left-back between 1911 and 1913. Middlesbrough paid £1,000 to sign Walker in 1913 and this dashing and powerful full-back served the Ayresome Park club well for 8 years. 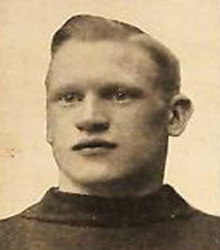 A final season in the colours of Reading brought his career to a close in 1922.